- Yellow and Red Referee cards, with scorebook and pencil, Used to mark coin toss, scores, fouls etc. 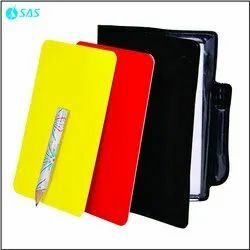 Set of Yellow & Red card.. without any logo.. Good prices..
2 Cards Red & Yellow, Pencil & Notes. Whistle, Lanyard, Toss Coin, pencil. 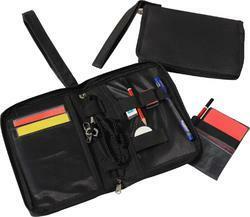 - Referee Warning Kit consist of 2 Cards Red & Yellow, Pencil and Match Notes. - All in a wallet. We provide premium quality referee cards used for various indications as per the rule of the game. The cards are made using materials, which matches International standard. - Description: Includes 2 color PVC warning cards along with data note sheet and pencil.